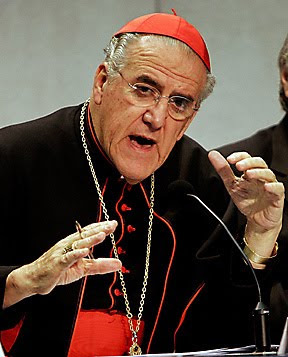 In comments that -- no surprise here -- were widely reported in little time, a retired Curial cardinal told an Italian website that "transsexuals and homosexuals will never enter the kingdom of heaven"... and notably earned a quick retort from the Vatican's official spokesman. The Holy See's lead hand on health-care until his April retirement as president of the Pontifical Council for the Pastoral Care of Health Workers, the remarks of Cardinal Javier Lozano Barragán were published on Wednesday by Pontifex, an Italian church-news site. Alongside his top line, the 76 year-old prelate said that "no one is born homosexual, but becomes one" and repeated his assertion that "they will certainly not enter the Kingdom of Heaven. "It may not be their fault," he added, "but acting against nature and the dignity of the human body is an insult to God." Though Lozano qualified his statement to say that "it is not I who say it, but St Paul," the Holy See Press Office offered up a starkly different response. In a statement e.mailed to the Vatican press corps and relayed by Catholic News Service, the papal spokesman, Jesuit Fr Federico Lombardi "first of all" sought to "point out that the [Pontifex] site lacks authority and is not a good source for understanding with objectivity the church's thoughts on complex and delicate issues like evaluating homosexuality. "It would be better, for example," he added, "to refer to the Catechism of the Catholic Church, which does talk about homosexual acts as 'disordered,' but takes into account the fact that 'the number of men and women who have deep-seated homosexual tendencies is not negligible.'" Gays "must be welcomed with respect and sensitivity," the response closed, "and 'every sign of unjust discrimination in their regard should be avoided.'" On attempts to reach him for further comment, Catholic News Agency reported that Lozano was unavailable "due to a minor medical procedure." As of press time, whether or not said procedure involved a muzzle remained unclear. The cardinal, however, said in a statement sent to ZENIT on Thursday that his words were taken out of context. The cardinal said he was referencing the Bible, specifically St. Paul's Letter to the Romans, 1:26-27, which says (in part), "Males did shameful things with males and thus received in their own persons the due penalty for their perversity." "This is what the Word of God says, it isn't what I said," Cardinal Lozano Barragán affirmed. "Now, I have never said that a particular homosexual cannot be saved, because he can be saved." "Many times one is not a homosexual through one's own fault; it all depends on one's education and environment," the prelate clarified. Cardinal Lozano Barragán reiterated the Church's teaching on grave sin: "The only thing I can say is that for grave fault to exist, in addition to needing grave matter, one needs full knowledge and full consent: Where one of those three conditions is lacking, there is no grave fault." Above all, the cardinal stressed that he is not the one who judges people, since God is.